Heat the stock in a pot and keep on a low simmer. Pour some stock over the porcini mushrooms, let soak for a couple of minutes, remove and chop, reserve soaking liquid. Soften onions with a good pinch of salt in butter, turn up the heat add rice. Stir in wine until liquid has cooked in, add the reserved soaking liquid and chopped porcini mushrooms. Wait till that’s been absorbed, turn heat down to a simmer and start adding the hot stock, one ladle at a time, always stirring the mixture. Grill the wild mushrooms using a griddle pan, ensuring they are a nice brown toasted colour. Put them in a bowl and add the lemon juice, chopped herbs and salt. Take the risotto off the heat and make sure the rice is soft, there should only be a very slight bite. Check seasoning, add more to taste and add parmesan and butter. 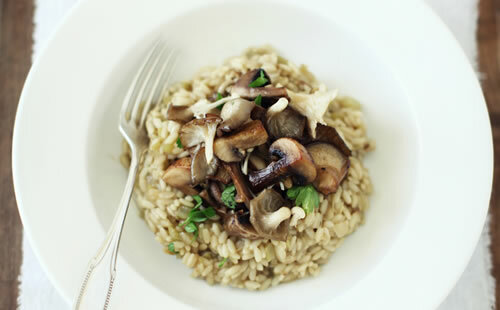 Let the risotto sit for a minute or two and serve with the mushrooms scattered on top with a sprinkling of Parmesan and some olive oil.